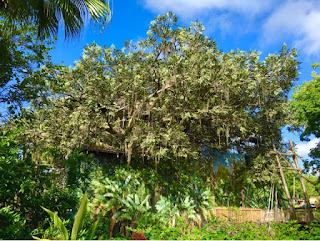 The Swiss Family Treehouse is undergoing a major refurbishment. Like with most structures in the parks, they no longer put up scaffolding where it can be seen by guests. They typically cover it with some sort of scrim. Over the past few years, through the use of photography, the scrim is usually made to look like what it is covering. Unless you look carefully at this shot, it's not easy to tell that the lower half of the tree is basically camouflaged with one of these photograph covered scrims. There are three railroad stations around the Magic Kingdom, and each one is full of great details. 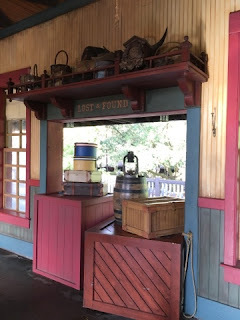 This shot is from the waiting area of the Frontierland Station. 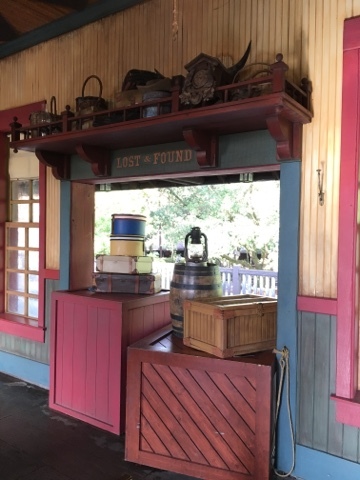 The sign says "Lost and Found," and there are a bunch of items there that are right out of the 1800s. The Magic Kingdom Car Barn houses the horse drawn carriage when it's not in use. 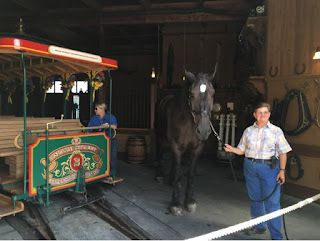 Sometimes, shortly after their shifts are over, you can actually see the horses hanging out in this spot. I took this shot last week while doing some tour research at this park. I took this photo of the center of Adventureland on an early morning visit to the Magic Kingdom last week. You can see how quiet this section of the park is at that hour. You can also see the puddle on the ground from the camel spitting. I think he was just warming up for a day full of spraying unexpecting guests walking by. While watching the afternoon parade at Magic Kingdom yesterday, I found myself in a good spot for photos. My favorite float is the fire breathing Maleficent. I like the way the fire looked, as if it was almost igniting City Hall. The Sir Mickey's shop in Fantasyland primarily sells princess themed merchandise. It is also the exit for the Cinderella meet-and-greet. 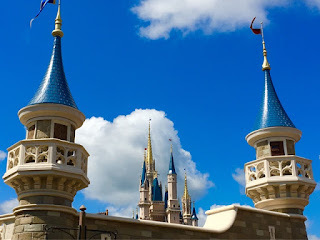 Today, I was standing near the shop when I noticed the spiars of Cinderella Castle towering overhead, and I thought it would make for a fun picture. This structure, across from Expedition Everest, is the FastPass entrance to Animal Kingdom's newest "theater." The 5,000 seat area on the banks of the Discovery River is temporarily home to a Jungle Book themed show. However, Rivers of Light, the permanent show, will be debuting sometime later this year. I love the amount of detail that Disney puts into something as simple as an entryway to an outdoor theater. 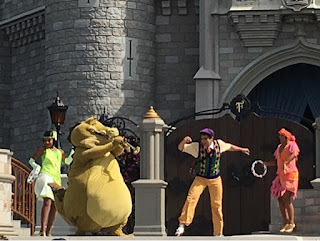 A new show recently debuted on the castle stage at Magic Kingdom. It is called Mickey's Royal Friendship Faire, and it stars Mickey and his pals, as well as characters from Tangled, Frozen, and The Princess and the Frog. 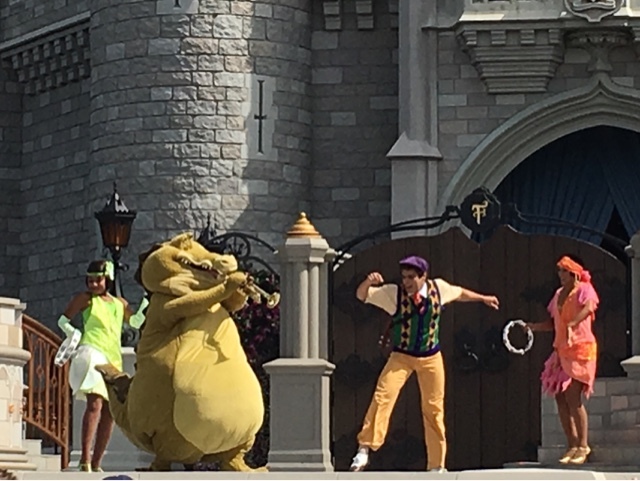 This shot features Louis the alligator from The Princess and the Frog. 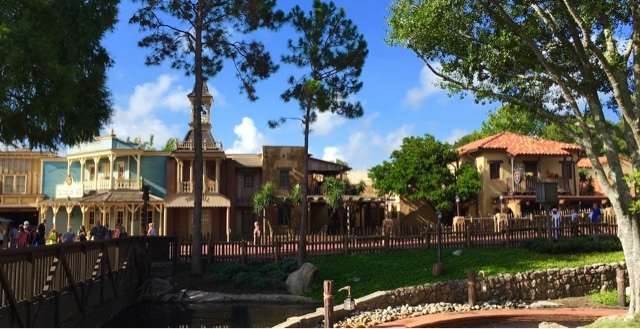 Pecos Bill's is one of the larger quick-service dining spots in Walt Disney World. This group of different exteriors is all part of that one restaurant. I took this shot yesterday, from near the bottom of the large drop at Splash Mountain. I needed to be in this spot to get all of Pecos Bill's in the frame. This morning, I had the chance to take some shots over at the Frontierland Shootin' Arcade. This classic and often overlooked attraction has been in the Magic Kingdom since opening day in 1971. 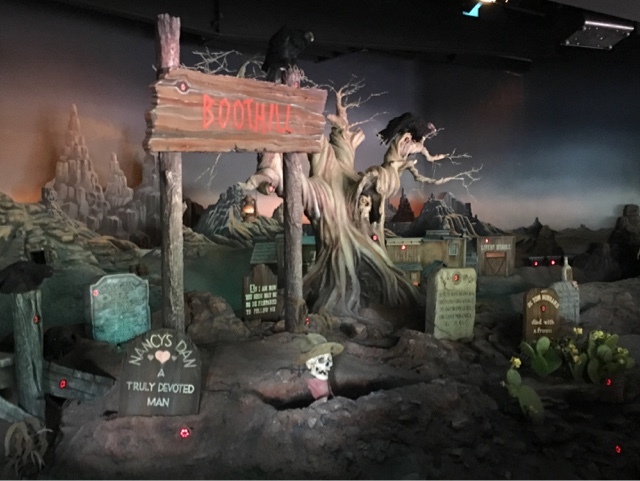 Just before I took this photo, I hit a target that raised the skeleton in the hat out of the ground. 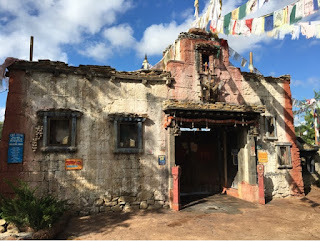 Although the Avatar section of Animal Kingdom is still about a year from completion, guests can see elements of the area rising above the trees. It appears the main entrance to "Avatar Land" will be the area that used to be Camp Minnie Mickey. 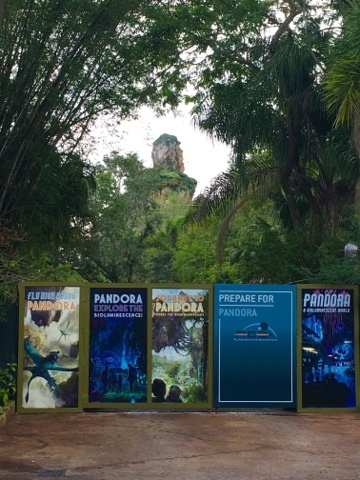 This wall advertises Pandora and you can see one of the floating mountains in the background. I am certainly excited to see this huge new addition open next year! The Cretaceous Trail is a fun little walkway in Dinoland at Animal Kingdom. 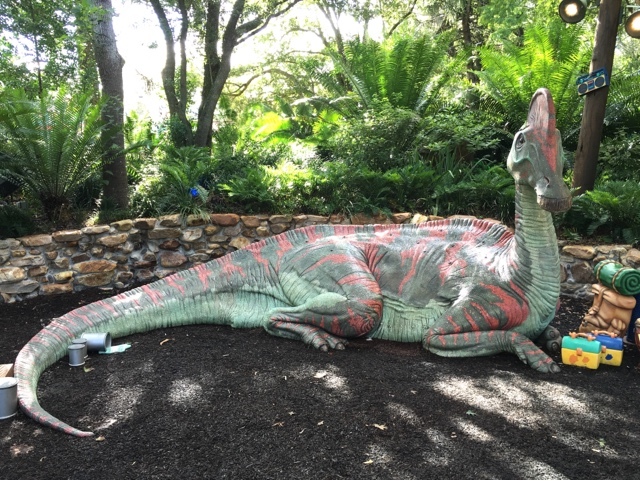 You can find kids climbing on and around this dinosaur at times. It is also used as a character meet-and-greet area. If you look on this guy's back, you can find a small hidden Mickey. 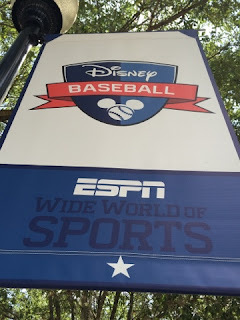 The ESPN Wide World of Sports is an amazing complex at Walt Disney World. It hosts events from national cheerleading competitions to the Pop Warner youth football championship. I took this shot while enjoying a youth baseball tournament that my son participated in a few weeks ago. The Main Street Cinema has changed quite a bit over the years. 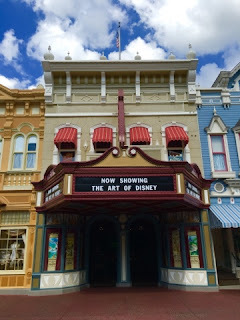 In the "old days" you could actually go there to watch Disney animated shorts. However, this spot is now used as a store that sells Disney art. Last month, the new version of Soarin' debuted in Epcot. 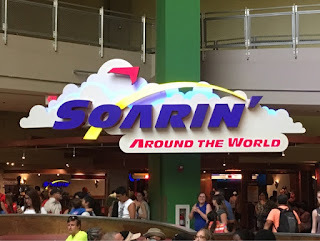 It is called Soarin' Around the World, and it takes guests over many famous landmarks on Earth. Just like the original attraction, there are amazing views and interesting scents. I took this shot while giving a tour last week. I had this view while I was getting gas today, across the street from Disney Springs. You can see several icons in this shot, including the new water tower, Characters in Flight Balloon, and Planet Hollywood. The front entrance of the new "Town Center" area can be seen to the far right of the picture. 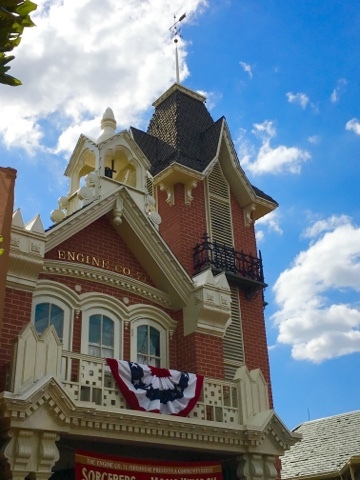 The Magic Kingdom Fire Station has been a part of Town Square since the park opened. The Engine Company "71" is a reference to the opening year. 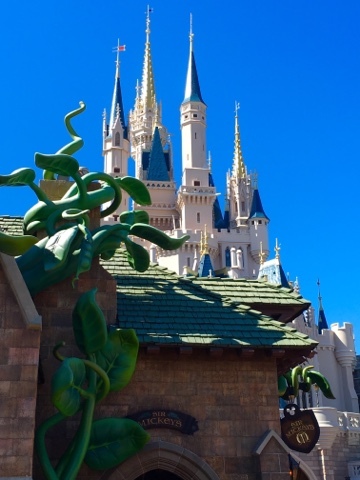 The building now houses the headquarters for the Sorcerers of the Magic Kingdom game. I took this shot while giving a tour last week. Although the Maelstrom ride has been converted to "Frozen Ever After," many of the Norway building exteriors have remained unchanged. However, you can find this small addition near the entrance of the new ride. 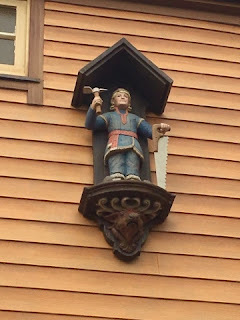 It is a carved wooden figure of Kristoff, one of the stars of Frozen. This may be the first time I've posted a picture of the same stucture on back to back nights. 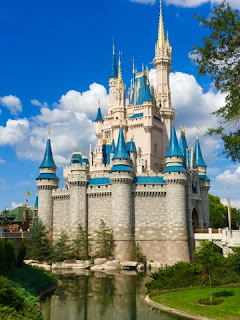 However, it is a much different view of Cinderella Castle. I took this shot from a stairwell at Disney's Contemporary Resort on July 3rd, during the Independence Day fireworks. You can also see Astro Orbiter in this photo. Although I have many shots of Cinderella Castle over the years, I couldn't resist taking this one last week. I was on the bridge to Liberty Square when I noticed something interesting. If you zoom into the water in this photo, you will notice a mother duck and her babies swimming toward the castle. 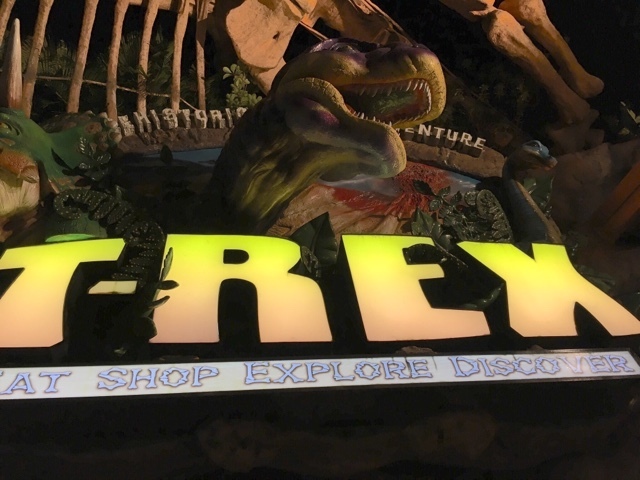 T-Rex is one of our favorite spots for a bite at Disney Springs. The theming is fun and the food is good. We enjoyed dinner with friends there last night, when I took this shot. The Contemporary is the closest resort to the Magic Kingdom. 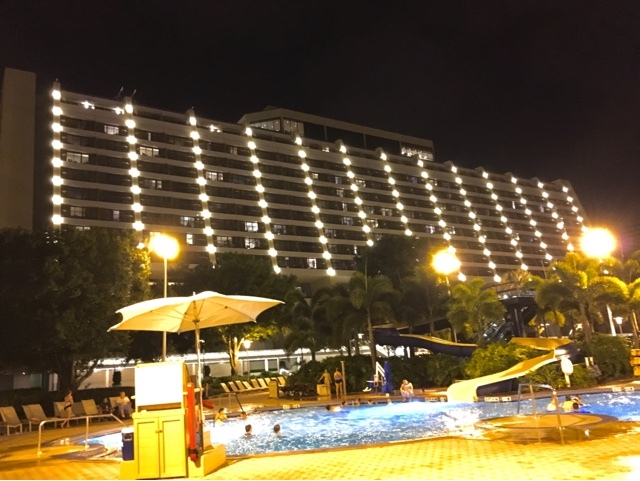 We watched the July 3rd fireworks from this hotel. Afterwords, we went down to the pool with some friends, where I took this shot. The Plaza Ice Cream Parlor is a popular spot on the northeast corner of Main Street, USA in the Magic Kingdom. 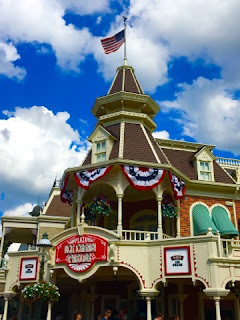 It is a great place for a cone or a sundae, especially on a hot day. 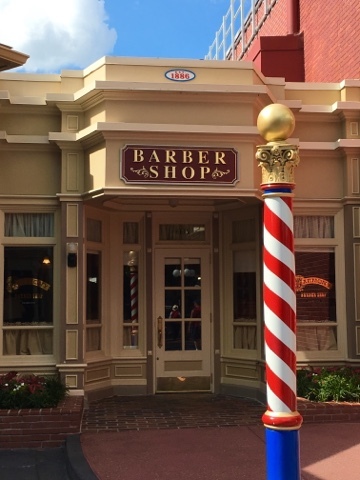 This spot uses a "smelitzer" to pump the waffle cone scent on to Main Street, which certainly draws guests in. 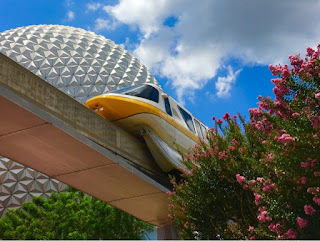 As I was leaving Epcot yesterday, I saw an arriving monorail entering the loop. I decided to move across the way, to get a good view as it was coming around toward the station. I was able to get this classic Epcot shot, with Spaceship Earth in the background. 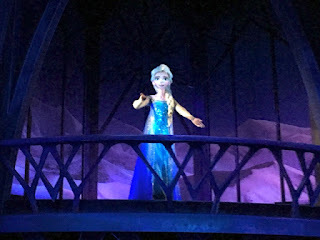 I visited The Seas while giving an Epcot tour today. 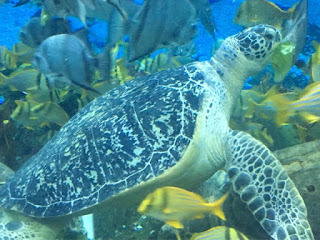 We were standing at the glass of the large aquarium during feeding time. I snapped this shot of a sea turtle enjoying his breakfast. Tucked in the northwest corner of Town Square is the Harmony Barber Shop. This is the spot where I've gotten my hair cut since I've lived in Florida. While I was in the barber's chair today, several guests walked in and were surprised to see that it was a real, working shop. I think most guests are surprised when they first learn that this service is offered at the Magic Kingdom. The 4th of July fireworks at Magic Kingdom are some of the best of the year, and they do the show on the 3rd as well. 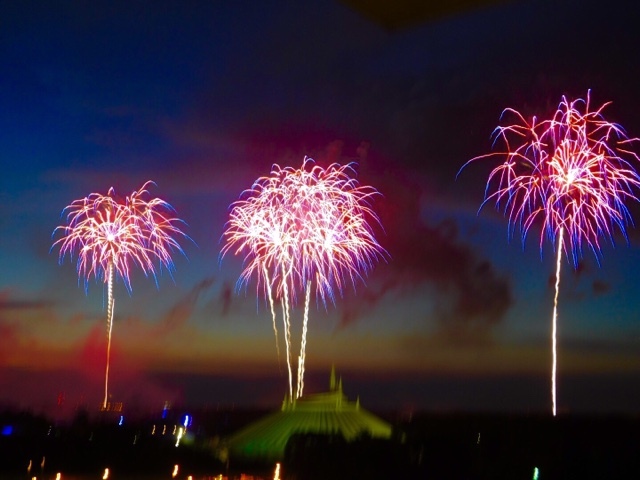 This year, we watched them from an 8th floor outdoor stairwell at The Contemporary. I used the "fireworks" setting on my camera to get this shot. The Electrical Water Pageant takes place on Bay Lake and Seven Seas Lagoon. 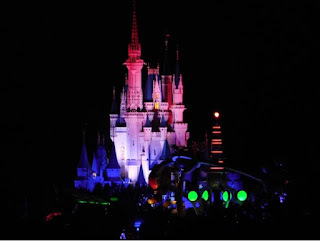 This "parade" of lighted barges entertains hotel and Magic Kingdom guests on a nightly basis. 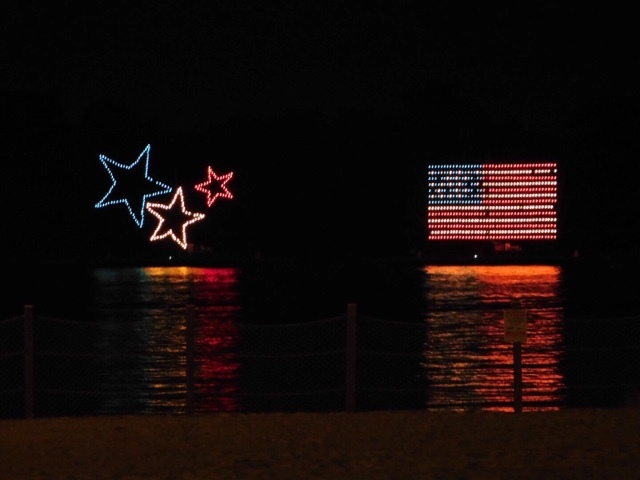 Although the finale has a patriotic theme, it seemed more appropriate tonight, on the eve of Independence Day. I took this shot from the beach at The Contemporary tonight. I had the chance to experience the new Frozen Ever After attraction at Epcot today. Although it uses the track from the old Maelstrom ride, it really has a completely different feel. 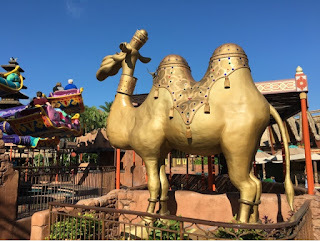 The animatronics are great, and this will surely become one of the favorite attractions in World Showcase. I took this shot because of the perfectly blue sky in the background. I was in between the Seven Dwarfs Mine Train and Enchanted Tales with Belle. I tried to use the spires as a frame for the distant Cinderella Castle. 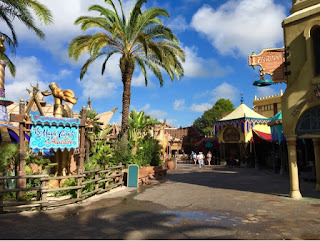 The Magic Carpets of Aladdin opened in Adventureland in 2001. 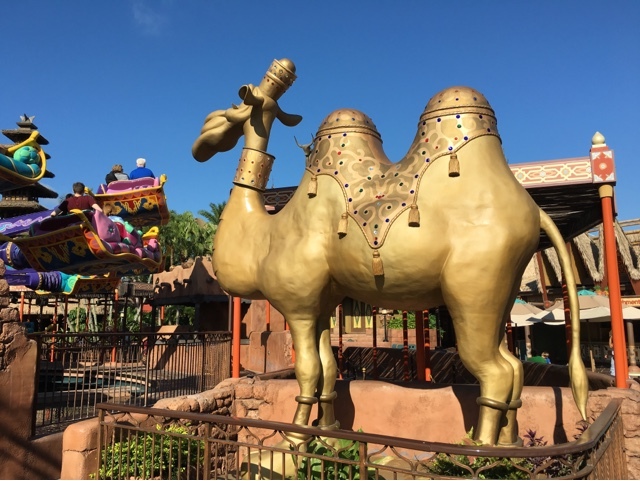 This camel spits water at guests as they fly by on their carpets. 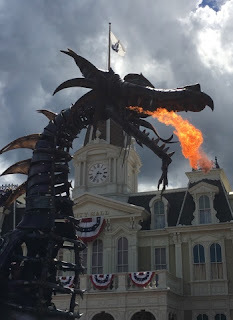 However, it was originally used in a parade at Hollywood Studios back in 1994. I took this shot a few weeks ago, while my tour guests were enjoying the attraction.